A root canal procedure requires one or more appointments and can be performed by Anthony Dailley, DDS. While the tooth is numb, a rubber dam (a sheet of rubber) will be placed around the tooth to keep it dry and isolated from the other teeth. Your Berkeley dentist will then create a hole at the top of the tooth, and clean the infected pulp from inside the tooth. 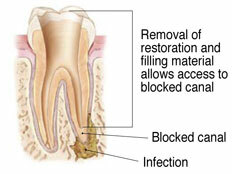 Medicine will be applied to remove any bacteria, and a temporary filling will be placed. When the tooth has had time to heal from the root canal treatment, you will need to return to our office to check the healing of the tooth. If the tooth has healed, then it will be ready to have a permanent crown placed to prevent any further decay or fracturing of the treated area. At times the tooth requiring treatment has a complex root or the infection is such that it needs a specialist, called an endodontist, to examine and complete root canal therapy. Anthony Dailley, DDS will work closely with our endodontic specialist to review your treatment case, send necessary records to their office, and place the crown after your root canal is completed. Our office staff will help coordinate your appointments, and help you understand your financial responsibility.